Freshman Kevin Love recorded a double-double in his first game as a collegiate to lead the Bruins to a 111-61 trouncing of the Azusa Pacific Cougars in front of 8,211 at Pauley Pavilion. Love finished with 15 points on 6 of 10 shooting and a game-high 12 rebounds. However the victory celebration was short-lived when it was revealed after the game that junior point-guard Darren Collison injured his left knee. He left the locker room with his knee wrapped and walking on crutches. Collison felt something in his knee pop after the second possession of the game but decided to continue. After the game he reported that the left knee was sore. "It was bothering him after the game," UCLA Coach Ben Howland said. "There's no swelling. Normally with a torn meniscus there's some swelling." He will have an MRI performed on the left knee on Saturday. Collison scored 12 points in the winning effort including a game-high 7 assists in 26 minutes of play. He set the tone in the first possession of the game when he stole the ball at the top of the circle and scooted down for a rousing slam to electrify the home crowd. The Bruins raced out to a 10-0 lead capped by a three-point shot by Love. Howland, who had been non-committal about naming his five starters, perhaps surprised some by starting sophomore Russell Westbrook at shooting guard alongside Love, Collison, Josh Shipp, and Luc Richard Mbah a Moute. The sophomore guard finished with 14 points including 6 of 7 from the line. Westbrook brings a level of intensity, especially on the defensive end, however one of the concerns with starting Westbrook is the potential for foul trouble since he is the primary back-up at point to Collison. The problem became evident in this game when Westbrook picked up quick two fouls in the first eight minutes of the game and had to sit down. Although he returned in the half of this exhibition, in a real game he may have been forced to sit out the entire half thereby forcing Collison to play without a back-up. It will be interesting to watch how this evolves over the next week. Josh Shipp lead all scorers with 20 points on 8 of 11 shooting including a couple of monstrous slams in transition. Michael Roll came off the bench to hit 3 of 5 three-pointers to finish with 16. Roll is a different offensive player this season. In prior years, Roll would settle for outside jumpers, but now a junior, he has filled out physically and is much stronger. He attacked the basket on a few occasions, in one instance he received the ball off a cut and made a tough lay-up while being fouled hard by the defender. Nikola Dragovic has never been shy about shooting and took advantage of the numerous open looks he had in the game finishing with 11 points on 3 of 5 shooting from beyond the arc. The Bruins shot 54.5% (12-22) on three-pointers for the game. Shipp was also 3 of 6 from beyond the arc. With Love leading the way, the Bruins dominated the boards 49-29. Mbah a Moute grabbed 6 caroms an Lorenzo Mata snagged 6 rebounds coming off the bench. UCLA went into halftime with a 48-26 lead and extended the lead to as great as 55 points in the second half. 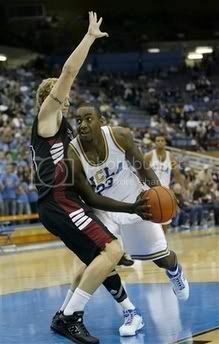 The Bruins next face Chico State in their last preseason match-up on Monday, November 5th at 7:30PM at Pauley Pavilion. In the meantime, they'll be nervously waiting to hear about the condition of their star point-guard. BBR Notes: J'Mison Morgan. a high school center recruited by UCLA, decided to commit to LSU today. Morgan's AAU coach has a strong relationship at the LSU program, and Morgan was impressed by his visits to the school as well by visits by former LSU alumni Tyrus Thomas and Shaquille O'Neal. The Bruins came out with their commemorative gold "C" on their uniforms, however, the gold "C" is now outlined by Bruin blue to help the letter itself stand out better against the home white uniforms. I was at the game and Josh Shipp's outside shot looked real good. Also Love's passing was very impressive. I knew about the outlet passes but he really surprised me with how well he passed when he was feed the ball on the blocks. I see alot of easy points coming this season by making sure the ball goes through Love's hands on every possesion. I have seen Love play on TV but he looked great in person. Love is scary good, he plays effortlessly out there. I hope Collison is healthy because this could be a very special year. I agree, Roll looked solid today. I know just an exhibition game, but he looked very confident with his game. Here's a video I shot of the introduction of the UCLA starting lineup. 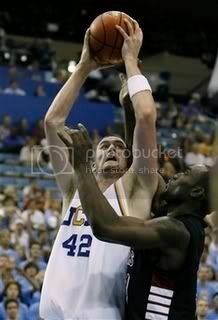 Kevin Love's Bruin debut....worth commemorating. Bobby, thanks for sharing. We'll link your video to the top of the site. BBR - please please please let us know of the Collison MRI as soon as you hear something. My heart sank when I read of the injury this morning. Knocking on wood for a negative MRI! Hey BBR....you called me 'Barry' in the post of the video in the top left corner. Love your site. GO BRUINS! Darren had an MRI performed at 1230PM today. Hopefully we'll here soon. His knee still did not have any swelling this morning. Unfortunately the Bruins will have more new on the injury front. Michael Roll severely hurt his ankle in practice today and may be out for some time - he went up for a rebound and landed on someone's foot. In addition, Josh Shipp had his right hand heavily bandaged and left practice early as well. Not sure what happened to Shipp's hand, the injury could occurred during the Azusa Pacific game - don't know how serious the injury is at this point. we've dealt with injuries before. nothing could be worse than 05/06. this means we get our depth tested. ben is reluctant about using younger players but back then he was forced to play luc. now he'll have to find another, maybe stanback. Interestingly, shortly after Roll injured his foot, Howland yelled at Stanback after he made mental mistake at practice today and indicated to Stanback that he needed to button down because he was going to be playing a lot of minutes due to Roll's injury. You have to love your enthusiasm for the team. The Bruins need more fans like you. We don't usually like doing predictions, because so many things happen during a season that can turn it on its ear - just look at today's injury report. However, with Love in the middle and a relative veteran squad - this can be a very special team. If the Bruins can stay healthy, or get healthy by tourney time, they will definitely do some damage come March/April.